Antonio y Cleopatra Whiffs Cigars have a long history of satisfying American smokers ever since they were established in 1879. 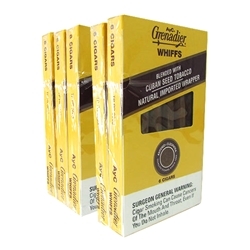 AYC Grenadier Natural Dark Whiffs Cigars are fairly mild tasting cigars possess a Cuban seed tobacco with a sheet binder and comes in different natural leaf wrappers such as Connecticut Shade Natural, Connecticut Broadleaf Maduro and Java. Try AYC cigars today at Smokers Discounts!